The sun was bright and the sky was clear as I happily skipped my way to the Post Office to pick up my Hobonichi order. I decided to start sharing some of my Hobonichi pages here along with some anecdotes that goes on in my world filled with stationery. Let’s start this series of post with my adventure to New York over the weekend for a company tour hosted by AMA Emerson. The Hobonichi challenge for April 6th was peppers, so I decided to draw both variety that dominates my life: chili pepper and bell peppers. Before you ask, this was done in very saturated watercolor to achieve that marker effect! 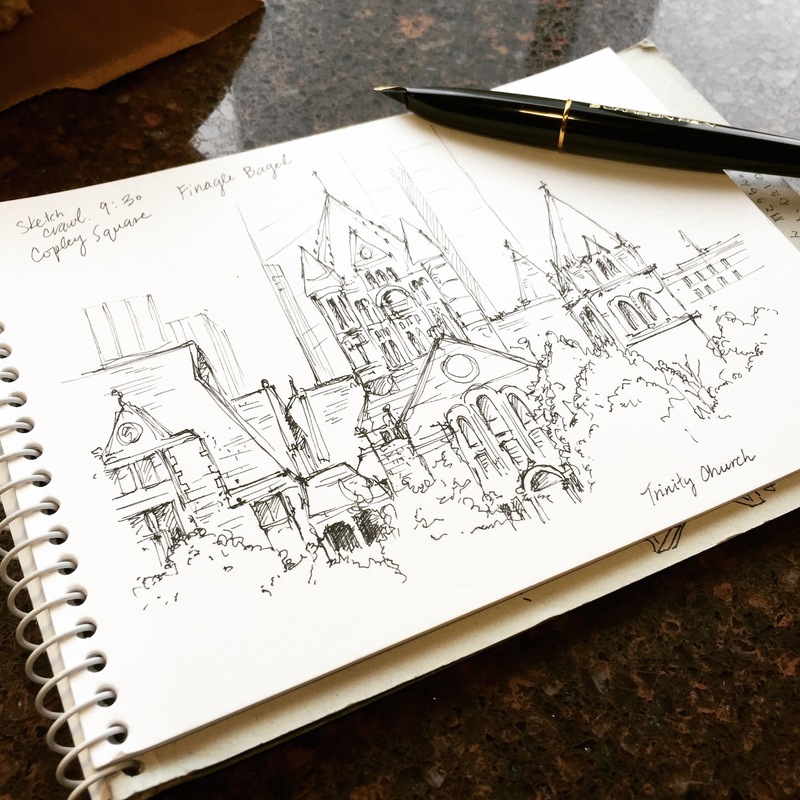 On October 24th was the national Sketch Crawl event! Urban sketchers from all over the world are united in this special event where they try to capture the beauty of their city through sketching, water-colour, or other artistic mediums~ It was especially inspiring to know that on that day, there are hundreds out there sharing the same passion of drawing and appreciating the city with our observant eyes! Of course, I would never miss it for the world. 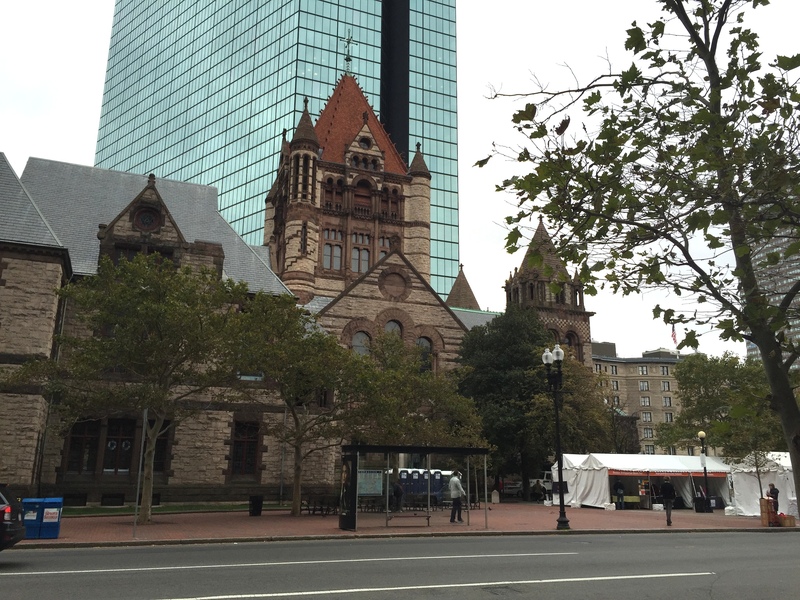 Together with the Urban Sketcher group here in Boston, we set out to sketch and paint downtown Boston and later to Harvard Square! 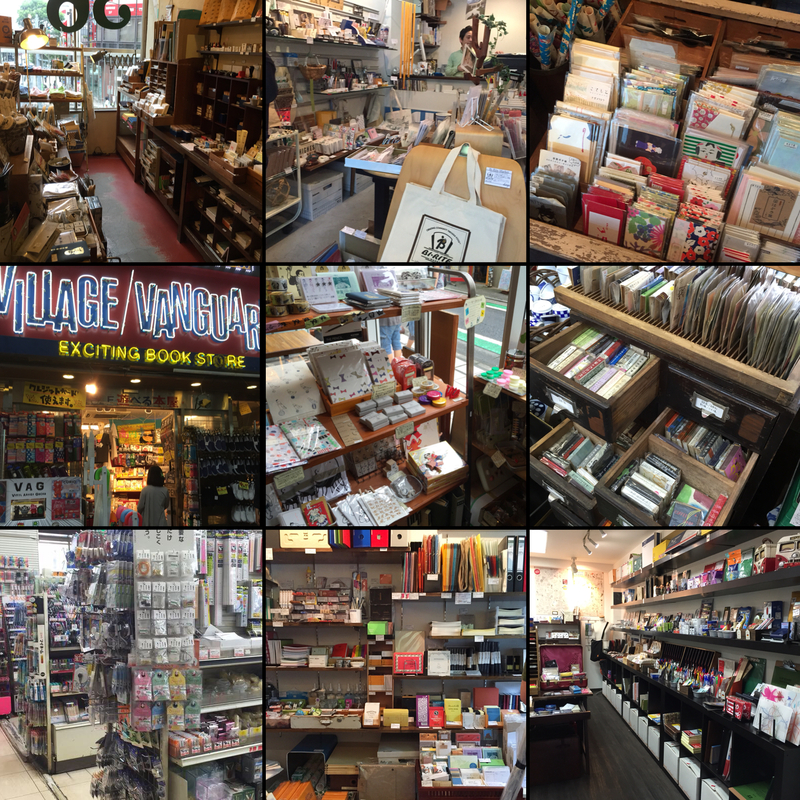 This summer, I planned a special trip to Tokyo as a goodbye tour to Asia as I prepare to move to the US for the next two years (Goodbye, stationery heaven!). 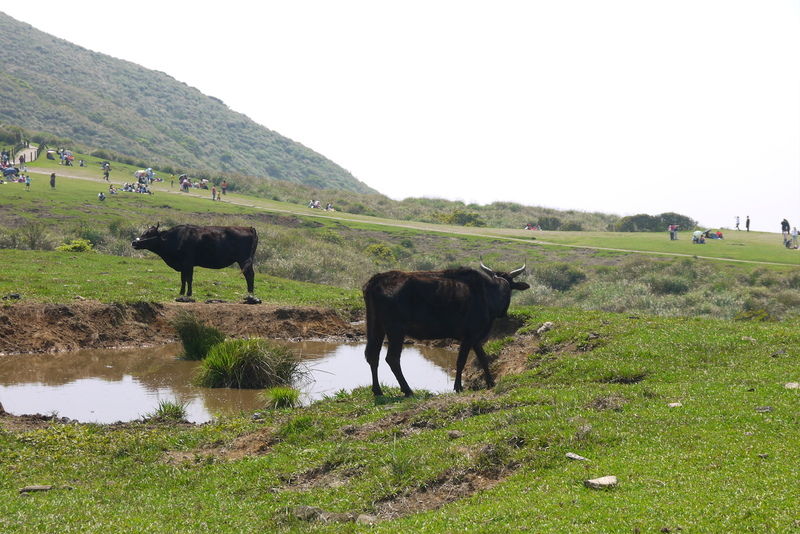 My friend Esther is nice enough to offer me a place to crash in Yokohama, so I had the opportunity to explore many places between the Kanagawa prefecture and Tokyo city! I compiled a detailed list of stationery stores I have to visit from reading various stationery related magazines in bookstores. Of course, with some help from google translation, I also found many local unique stationery stores that have interesting items. The random finds on this trip are also an intriguing experience, and you bet I definitely stock up on a lot of stationery items! I’ll be sharing in this post my haul from my Tokyo trip. I like to get things that are practical for my journaling hobbies, pen pal exchange tools, and paints for my drawings and water-colour doodles. Another fashionable trend among stationery addicts are small toys they call Table Top Things (such as figurines from gashapon dispensers and paper weights), and I cannot resist getting some cute ones to put on my future reading desk. Friday was a national holiday in Taiwan because the government was compensating a day off for Qingming Holiday where everyone goes home to pay respect to the ancestors. 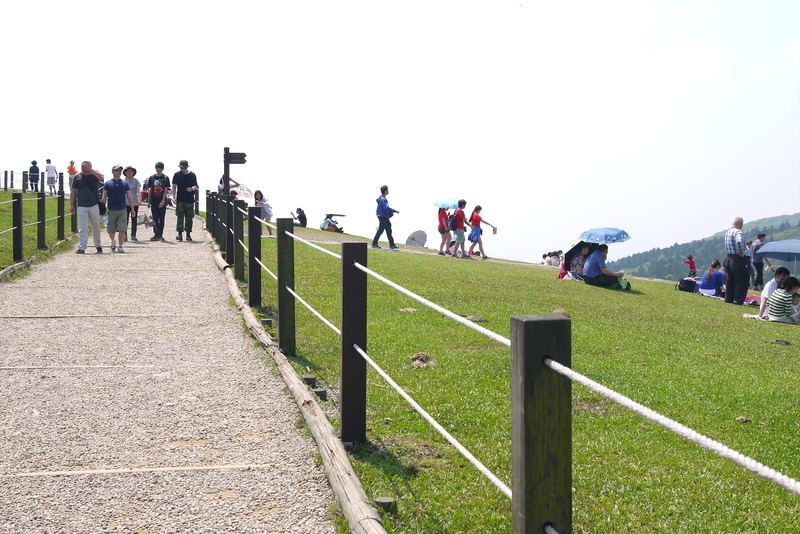 My friends and I took advantage of this day off to go on a Picnic to Qingtiangang, a beautiful expanse of plain on top of Yangming Mountain. Of course I brought along my paints and sketchbook in hope to capture the beautiful scenery. I wasn’t disappointed, because the weather was super nice and I’d say it’s even feeling like summer has arrived! I recall when I was here last time (about two weeks ago), the weather was dreary and there was heavy mist up on the trail. We couldn’t see a thing within 10 feet, so we gave up and went home disappointed. (However, we did get to see some cherry blossoms on the way down the mountain). Continuing my previous post on my December page flip throughs, my daily entries consisted of a main illustration for the day, and surrounding it are my journaling of the day’s events! I’m not that great a writer, and I don’t want to pressure myself into writing fantastic entries that are full of meaningful thoughts or anything like that. Therefore I try to focus my art on doodling and replicating photos that I’ve taken in my iPhone for that day. 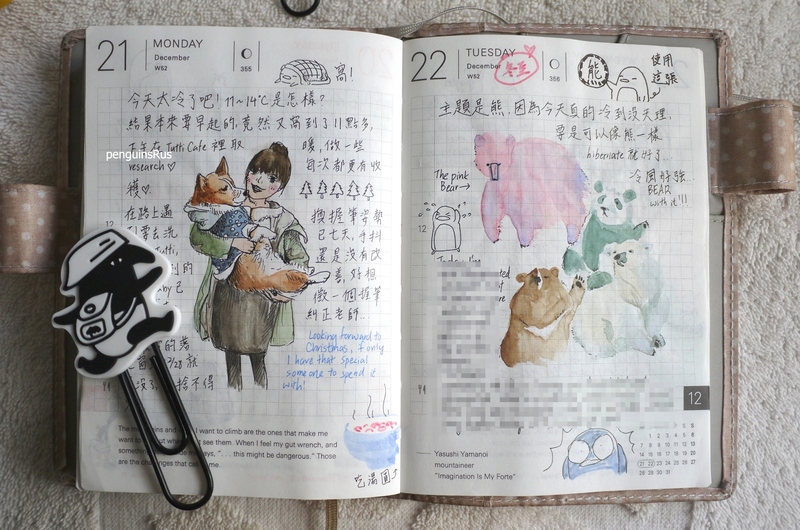 Sometimes I take inspiration from Hobonichi entries shared on facebook pages or cute images I’ve seen on Instagram. Luckily I don’t have to rely much on prompts yet to come up with things to draw. There are too much interesting things around me that I would love to put into doodles and writing.